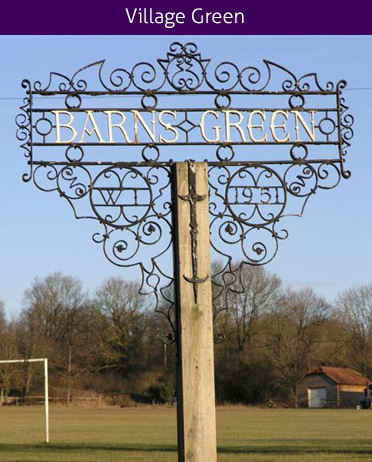 The last owner of Muntham gave the Village Green to the residents of the parish, to be held in a charitable trust 'The Barns Green Playing Field and Village Hall Trust'. The Green and Hall are still owned and administered by the Trust, which leases a small piece of the land to the Barns Green Sports and Social Club. In addition to the village green, the surrounding field, known as the Jubilee Field, was purchased in two transactions - thirty years apart, 1977 and 2007 by Parish Council funding.